It’s hard to always play your A-game! I left January behind and was ready to set some records this month. I had an okay session on the 1st of February but again lost at the $5/$10 and won at $3/$6 and $10/$20. Then last Sunday things went completely different. I started out pretty bad and was down about $900 before things turned around. I grinded my way up, was playing really good for a long time and near the end of the session I won a $772 pot at the $10/$20. I haven’t checked it but this must be the biggest pot I’ve ever won at the $10/$20. After this pot I was up about $1.400 and managed to win another $600 on top of that for a total of $2072,50, my best session ever! 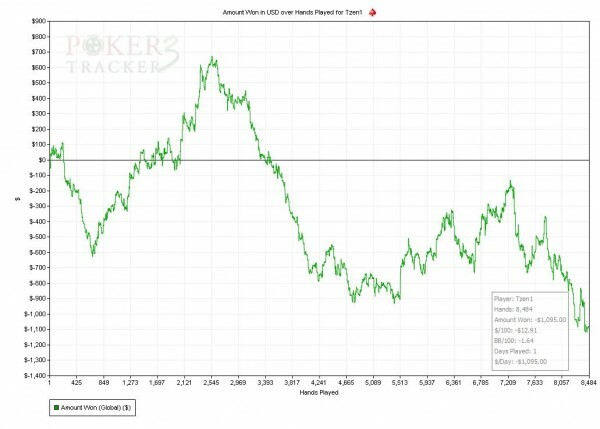 I wasn’t only up at the $10/$20 and $3/$6 this time, I actually managed to win the most at the $5/10, winning $1.289,50 at 4.19BB/100. Sure that isn’t a normal winrate but it felt like I finally got what I deserved after running bad for some time at the $5/$10. Since it was the night of the Superbowl there weren’t many tables to play and since I don’t have a SNE grind on my mind I just kept playing $3/$6 – $10/$20. I could have added some $2/$4 tables to get more VPP but I choose not to and focus more on my game. It worked out this time and I went to bed early (05:00) feeling pretty happy! So after Sunday’s session I was ready for another good score yesterday. There weren’t any $10/$20 tables to play early in the evening and I was down $600 really quick before getting back to break-even after which I took a small break to have some food. 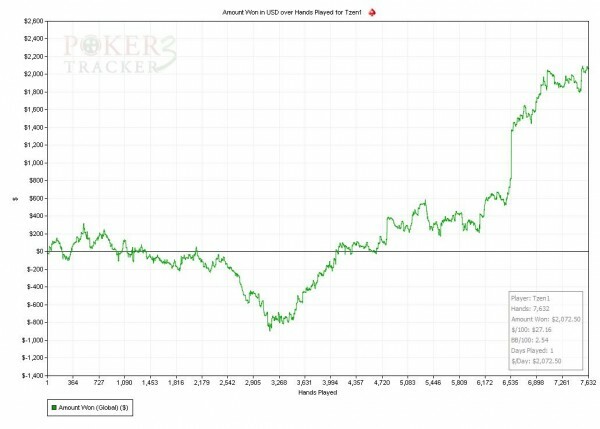 When I got back I continued to run good and was already seeing big numbers again in my head, then I got reminded about what’s poker is all about, swings! All of a sudden around 04:30 a lot of new tables popped up and after playing only 15 tables of $3/$6 and $5/$10 I was suddenly playing 24 tables which included 3 $10/$20 tables. At first it went really good, I was down $900 but grinded my way back to -$130 and just at that moment I lost 2 big pots on the river which would have gotten me in the black again. After that I just couldn’t play my A-Game anymore. I wanted to stop because I knew I wasn’t playing really good but I didn’t want to stop because there were a lot of tables going with a lot of bad players so the conditions to play were really good. I should have known that although the table conditions were fine to play, my state of mind wasn’t anymore but that’s an aspect that is always hard to grasp at the moment you are in it. As mentioned before I hardly tilt but this time I did make some stupid mistakes time after time. It ain’t the kind of tilt where you shove 27s all-in because they where suited but it’s more betting the river when you know the river card probably hit the other player but you just don’t want to believe yourself you got rivered again. I lost a total of $1.095 putting my feet back on the ground after the record session on Sunday. I think the changes I’ve made to my game are really good. 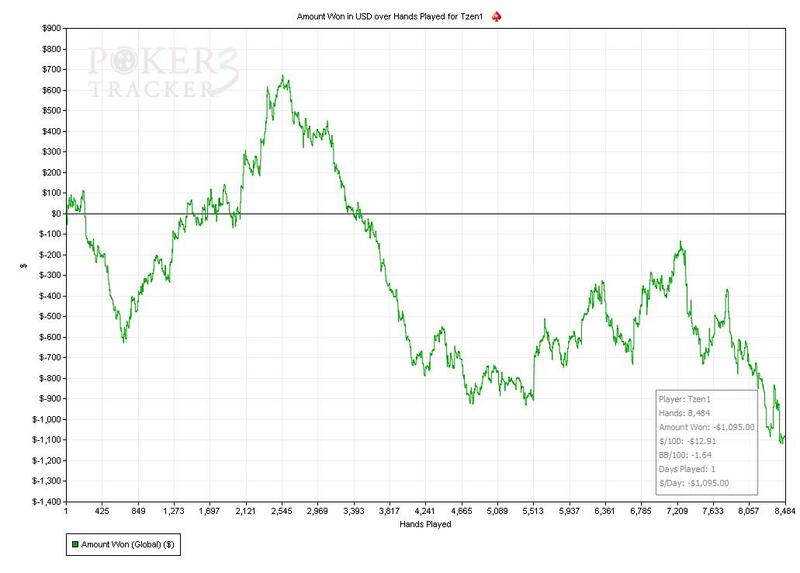 I think I’ve played better then ever during the last weeks and I believe I can win up to $10/$20 if I play my A-game. The hard thing however is to keep playing your A-game. It’s not like I can tweak a bot and it can repeat itself over and over again and win forever. I’m still human and my game changes without me even knowing it. I got in situations yesterday where I wasn’t really sure anymore what I could do best, while if I’m in the flow I’m not even really thinking about what I should do, I just know it. I hope to continue to play well, stuff like yesterday shouldn’t happen anymore but it’s inherent to poker. After writing this blog I will do some studying again to make sure I keep improving my game. Winning does keep me busy nowadays and I really hope I can do good this year. I think nothing but me stands in my way to grind back my losses from last year and that is really a personal goal. I would love to see my own lifetime graph going up again and currently pick that above trying to make as much as money, possibly by getting SNE again. It’s a hard thing in poker anyway to determine what’s the best way to earn the most money. If I’m a winner this year putting in as much volume as possible is of course the best thing but do you keep winning if you play that much? Nobody knows! I do however know that I value some more free time as well so I’m almost positive I’m not going to get SNE this year. I might be able to beat $5/$10 and even $10/$20 which gives me a good VPP/hr rate but I rather not get back to playing 24 tables non-stop and have poker on my mind 24/7. When I write this down it still hurts… The *5 multiplier is just crazy, the $20.000 bonus at the end is crazy but it’s also the idea of trying to accomplish something during a whole year that really attracts me to it! I think it might be the only reason why I would really love to play poker full-time but I also still really love my job so I’ll have to live with it. Great post, I think you definitely put into words how many players feel, myself included. For me, I don’t know if it is hard for me to continue grinding while I am winning because I want to protect my winnings as much as there isn’t some driving goal to make me grind out the hands (ex: getting back to even). Either way, keep up the winning! You can use the Google Website Translator Gadget in my blog to see it in your language. Please let me know if you are interested. January, good or bad? I love StarCraft… I mean Poker!